The company announces its final model for 2013 and delves into 2014 early, including an entire new line of motorcycles. Honda has shown the final 2013 model, the Pioneer side-by-side ATV, a replacement for the outgoing Big Red. The quad is powered by a 700cc OHV single-cylinder four-stroke engine and an automotive-style 3-speed automatic transmission. New styling completes the rugged build of the side-by-side while an innovative split rear seat folds to add more cargo space to the tilt bed. It will become available in late fall. For 2014, though, Honda will be pushing forward with a new line of motorcycles called the CTX series. The Comfort, Technology and eXperience line will enter most of the bike markets, starting with the smaller 700-class with the CTX700ND, which uses the new CTX chassis and the same powertrain as the popular NC700X - a proven machine. The difference between the CTX platform and the NC being the emphasis on riding comfort and ergonomic technologies. The CTX700ND is a parallel-twin machine with a low seat height and automatic Dual Clutch Transmission (DCT) and anti-lock braking at an MSRP starting at $7,999. 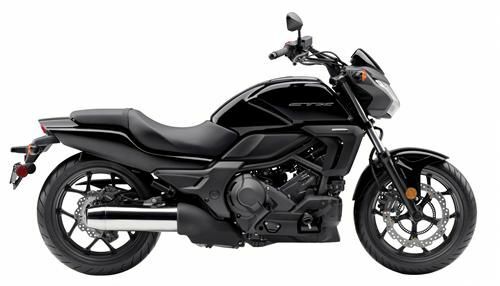 For highway riding, the CTX700D starts at less than a thousand dollars more and comes with fairings and equipment meant for longer, more aerodynamic highway use. Both bikes can be purchased with a manual transmission for about a thousand dollars less. "Obviously this is great news for enthusiasts all across the riding spectrum," said Bill Savino, Honda Powersports Press Manager in a release. "We believe this new CTX series of motorcycles is going to be a big hit as it cuts across many demographic categories while emphasizing one key theme: the fun of riding, at an affordable price. Also, the new Pioneer Side-by-Side offers an elevated level of versatility, utility and convenience that establishes new class standards. And this is only the beginning. We will be releasing more information about other great new 2014 models, so stay tuned for more good news from Honda." The new CTX models will begin appearing in Honda dealer showrooms in late fall. Honda will not be ignoring the NC700X, however, which is made for "adventure riding." Built for on and light offroad use, the bike is aimed at the entry-level motorcycle market with a starting MSRP of $7,499 (manual) or $8,499 (DCT/ABS). The new 2013 model has an improved DCT, longer suspension travel for increased comfort, and more color options. It enters showrooms this spring.